Human follistatin is a regulatory glycoprotein with widespread biologic functions, including antiinflammatory activities, wound-healing properties, and muscle-stimulating effects. The role of follistatin in a wide range of biologic activities shows promise for potential clinical application, which has prompted considerable interest in the investigation of the protein as a potential disease-modifying agent. In spite of this potential, the development of follistatin as a broad use biotherapeutic has been severely hindered by a poor understanding and characterization of its pharmacokinetic/pharmacodynamic (PK/PD) relationships. Therefore, to better define these relationships, we performed in-depth analyses of the PK/PD relationships of native follistatin-315 (FST315). Our data indicate that the intrinsic PK/PD properties of native FST315 are poorly suited for acting as a parentally administered biotherapeutic with broad systemic effects. Here, we leveraged protein engineering to modify the PK characteristics of the native molecule by fusing FST315 to a murine IgG1 Fc and removing the intrinsic heparan sulfate-binding activity of follistatin. The engineered variant molecule had ∼100- and ∼1600-fold improvements in terminal half-life and exposure, respectively. In contrast to the native FST315, the variant showed a robust, dose-dependent pharmacological effect when administered subcutaneously on a weekly basis in mouse models of muscle atrophy and degeneration. These studies highlight the underappreciated and critical relationship between optimizing multiple physical and chemical properties of follistatin on its overall PK/PD profile. Moreover, our findings provide the first documented strategy toward the development of a follistatin therapeutic with potential use in patients affected with skeletal muscle diseases. Follistatin is a structurally complex molecule that is composed of 344 residues. It is generally accepted that two major isoforms of follistatin are present in humans that are a result of alternative mRNA splicing: follistatin-315 (FST315) and follistatin-288 (FST288) (Phillips and De Kretser 1998). Both protein isoforms contain identical core regions that are formed from a series of tandemly repeated domain elements: an N-terminal domain (FST 0), followed by three successive Kazal-type serine protease inhibitor/epidermal growth factor-like domains (FST 1, 2, and 3), and in the case of FST315, a highly acidic C-terminal tail is presented (Keutmann, Schneyer et al., 2004) (Fig. 1). The primary sequence of follistatin is punctuated by a preponderance of cysteine residues that form 18 disulfide bonds that interlink the aforementioned domain elements and that stabilize the overall protein structure. The molecular complexity of follistatin is further exacerbated by the presence of three putative N-linked glycosylation sites at asparagines residues in positions 95, 112, and 259 (Fig. 1). These structural elements provide a scaffold that allows follistatin to interact with and regulate the activities of several members of the tissue growth factor β–like family of proteins, including activins (Phillips and De Kretser, 1998), growth differentiation factors (GDFs) (Amthor et al., 2004; Sidis et al., 2006; Schneyer et al., 2008) and bone morphogenic proteins (Iemura et al., 1998; Fainsod et al., 1997; Otsuka et al., 2001; Amthor et al., 2002; Abe et al., 2004). The interaction of follistatin with these proteins modulates the ability of these ligands to bind to their cognate cell surface receptor(s). In addition, the three-dimensional structure of follistatin provides a molecular surface that facilitates interaction, in its apo and ligand-bound forms, with cell surface heparan sulfate proteoglycans (Sidis et al., 2005; Zhang et al., 2012). Domain architecture and posttranslationally modified N-linked glycosylation sites in follistatin-315 (FST315). N-linked glycosylation sites are designated by solid triangles with corresponding amino acid sites. The native heparin sulfate-binding site (HBS) in FST315 is located in the FST1 domain and comprises a linear stretch of amino acids 75–84 (Sidis et al., 2005). The C-terminal end of FST315 is composed of an unstructured highly acidic region. The varied biologic regulatory properties that follistatin governs has spurred considerable interest in the potential for follistatin-based therapeutics to treat a wide array of indications. Several groups have reported potent beneficial effects of follistatin administration in various indications, such as inflammation, liver repair, fibrosis, wound healing, hair regrowth, and muscle disorders, including muscular dystrophy (Kogure et al., 1995; Wankell et al., 2001; Fuwii et al., 2005; Fumagalli et al., 2007; Tsuchida, 2008; Zimber et al., 2011; de Kretser et al., 2012). Many of these disorders require systemic wide pharmacological effects, and as a result, several groups have focused on the use of gene therapy in the form of adeno-associated virus to obtain protein exposure levels required for activity in animal models of disease (Takabe et al., 2003; Kota et al., 2009; Medina et al., 2009; Foley et al., 2010). These studies have yielded promising proof-of-concept data for the therapeutic potential for follistatin; however, from a practical perspective, the use of follistatin–adeno-associated virus as a bona fide human therapeutic is squelched by a tenuous clinical and regulatory path. To date, the development of a recombinantly expressed follistatin-based biologic has been relatively unexplored. This is likely to have been attributable to its high degree of molecular complexity, structural properties, and N-linked glycosylation, which create significant challenges in optimizing the molecule’s structure-activity relationship along with its in vivo pharmacokinetic/pharmacodynamic (PK/PD) properties to develop a protein-based therapeutic for treatment applications. To address these factors in the current work, we leveraged protein engineering to design a follistatin-based therapeutic molecule that can be administered parenterally with the potential of broad use in multiple disease settings. Our initial studies using recombinantly expressed native FST315 showed that robust increases in muscle mass in a mouse model of muscle injury could be obtained only when local i.m. delivery was performed, but not with subcutaneous delivery. Our data suggest that the lack of effect after subcutaneous administration of FST315 was likely to have been attributable to the rapid clearance kinetics exhibited by the molecule. Therefore, to improve on the suboptimal PK properties of follistatin, we engineered a novel FST315 chimeric fusion protein fused with murine IgG1 Fc region (FST-Fc). These alterations were sufficient to dramatically alter the PK profile of FST-Fc in healthy mice and induce systemic effects with subcutaneous delivery in a mouse model of muscle injury. We were able to further improve on the PK profile of FST-Fc by removing the native heparan sulfate-binding activity of follistatin (FST-ΔHBS-Fc), which leads to robust, dose-dependent, systemic effects that could be achieved with weekly subcutaneous dosing regimens. Taken together, our findings highlight the exquisite interplay between balancing and optimizing multiple factors on the overall PK/PD properties of follistatin to provide the first example of a systemically viable follistatin-based biotherapeutic. The follistatin variants described in this report were expressed in stably transfected Chinese hamster ovary cells and were generated at Eli Lilly (Indianapolis, IN). Isolation of native FST315 containing a C-terminal hexahistidine tag from concentrated cell culture supernatants proceeded via a two -step purification method. In a first step, crude conditioned cell culture media containing FST315 was captured using Nickel-charged chelating sepharose (GE Healthcare, Waukesha, WI). Bound FST315 protein was eluted using a step gradient of imidazole, and pooled fractions were concentrated using a Amicon Ultra-15 concentrator (Millipore, Billerica, MA) and further purified using a Superdex G200 preparative gel filtration step (GE Healthcare). Finally, protein purity was assessed using both simply blue–stained (Life Technologies, Carlsbad, CA) SDS-PAGE gel analysis and analytical gel filtration on a TSKG3000SWXL column (Tosho Bioscience, Toyko, Japan) and was generally found to be >95%. Isolation of FST-Fc and FST-ΔHBS-Fc chimeric proteins from concentrated cell culture supernatants was performed using a two-step purification method. In the first step, crude conditioned cell culture media containing either FST-Fc or FST-ΔHBS-Fc was captured onto monoclonal antibody select sepharose (GE Healthcare) affinity chromatography under high salt conditions (1 M sodium chloride) and eluted using a step-gradient of 10 mM sodium citrate (pH 3.0). Pooled protein was concentrated using an Amicon Ultra-15 concentrator (Millipore) and further purified using a Superdex G200 preparative gel filtration step (GE Healthcare). These steps generally resulted in protein purity of >95%, as assessed by simply blue–stained (Life Technologies) SDS-PAGE and analytical gel filtration on a TSKG3000SWXL column (Tosho Bioscience). The interaction of the follistatin variants with heparin was measured using a chromatographic method in which approximately 100 μg of each follistatin variant in Hyclone Phosphate Buffer Saline (1×; Thermo Fisher Scientific, Waltham, MA) was injected using an Agilent 1100 high-performance liquid chromatograph (Agilent Technologies, Santa Clara, CA) onto a 1 ml heparin sepharose fastflow column (GE Healthcare) that had been equilibrated in 20 mM potassium phosphate (pH 7.0). Bound protein was eluted using a linear gradient of 0–100% 20 mM potassium phosphate and 1 M sodium chloride (pH 7.0), and extent of heparan sulfate-binding activity was assessed on the basis of observed column retention (measured in minutes) and the required concentration of sodium chloride to elute the bound protein from the column. Human embryonic kidney 293 cells stably expressing the SMAD binding element 12 luciferase system (Qiagen, Venlo, The Netherlands) were seeded in 50,000–100,000 cells/well/100 μl Dulbecco’s modified Eagle’s medium/F12 (Life Technologies) with 10% fetal-bovine serum in a poly-d-lysine–coated 96-well plate. After at least 16 hours incubation at 37°C, media were aspirated and replaced with 50 µl of 1% fetal-bovine serum– Dulbecco’s modified Eagle’s medium/F12. Follistatin variants were serially diluted (1:2) 1× phosphate-buffered saline (PBS; pH, 7.4) to produce the following titration range (3000–23.4 ng/ml). Each concentration was then mixed with an equal volume of 15 ng/ml of Activin A (R&D systems, Minneapolis, MN) or 45 ng/ml GDF8/myostatin (R&D systems and/or Eli Lilly and Company, Indianapolis, IN) and incubated at ambient temperature for 30 minutes, after which 100 µl of mixture was added to individual wells. Induction of SMAD reporter (i.e., 100% signal) was achieved by either Activin A or GDF8/myostatin alone, and negative controls (i.e., 0% background signal) were achieved by vehicle alone. Plates were incubated at 37°C for 20 hours, followed by aspiration, and washed once with 1× PBS. Cells in individual wells were subjected to lysis and luminescence measured using a GeniosPRO instrument with substrate injection (Luciferase Reporter Gene Assay Kit; Roche, Basel, Switzerland). Values shown in the figures are representative of transfection experiments performed in triplicate. Relative luciferase units were measured, and IC50 curves were fitted using Graphpad Prism software (GraphPad Software, Inc., La Jolla, CA). PK evaluation for FST315, FST-Fc, and FST-ΔHBS-Fc was conducted in normal male C57Bl6 mice (20–30 g; Harlan, Indianapolis, IN). In the case of FST315, animals were administered a single 1- or 3-mg/kg i.v. or s.c. dose of follistatin dissolved in PBS (pH 7.4). Blood samples were collected from three animals per treatment group per time point at 0.5, 1, 2, 4, 6, 8, 12, 24, 36, 48, and 72 hours after administration. 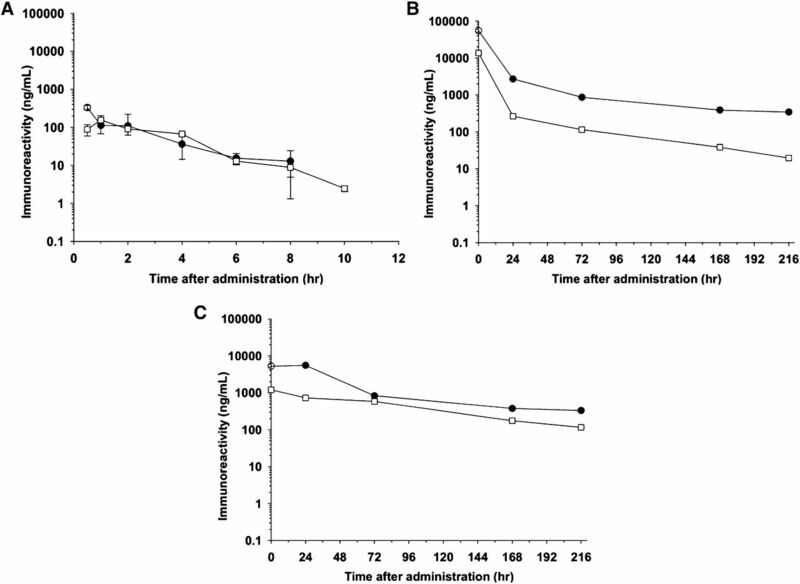 For FST-Fc or FST-ΔHBS-Fc, animals were administered a single 3-mg/kg i.v. or s.c. dose of each molecule dissolved in PBS (pH 7.4). Blood samples were collected from two animals per treatment group per time point for FST-Fc or FST-ΔHBS-Fc at 0.083, 24, 72, 168, and 216 hours after administration. In all the studies, the mouse blood samples were collected by saphenous vein, tail clip, retro-orbital, or cardiac puncture into tubes containing sodium EDTA as anticoagulant and processed to plasma for subsequent analyses. Concentrations of the follistatin variants in mouse plasma were determined using validated enzyme-linked immunosorbent assay for each of the compounds. In brief, each well of an Immulon 4 microtiter plate (Thermo Fisher Scientific) was coated with a monoclonal antihuman follistatin IgG (R&D Systems) at 4°C overnight. After washing and blocking, standards and samples were added to the wells in a volume of 0.1 mL and incubated for one hour at room temperature. The bound follistatin variant was detected by adding biotinylated polyclonal antihuman follistatin IgG (R&D Systems), followed by horseradish peroxidase–conjugated strepavidin (Jackson Immunoresearch, West Grove, PA). The bound FST-Fc and FST-ΔHBS-Fc variants were detected using horseradish peroxidase –conjugated goat antimouse IgG (Southern Biotechnology Associates, Birmingham, AL). The lower limit of quantitation in mouse plasma FST315, FST-Fc, and the FST-ΔHBS-Fc was determined to be 1.4 ng/ml. PK parameters for each of the proteins were calculated using the WinNonlin Professional software package (v3.2; Pharsight Corporation, Mountain View, CA). Plasma concentration-time data were calculated using a model-independent approach based on the statistical moment theory. The parameters calculated included Cmax, area under the curve (AUC0-∞), clearance (CL), and elimination half-life. All mouse experiments were performed with the approval of Institutional Animal Care and Use Committee and are in accordance with the National Institutes of Health Guide for the Care and Use of Laboratory Animals. 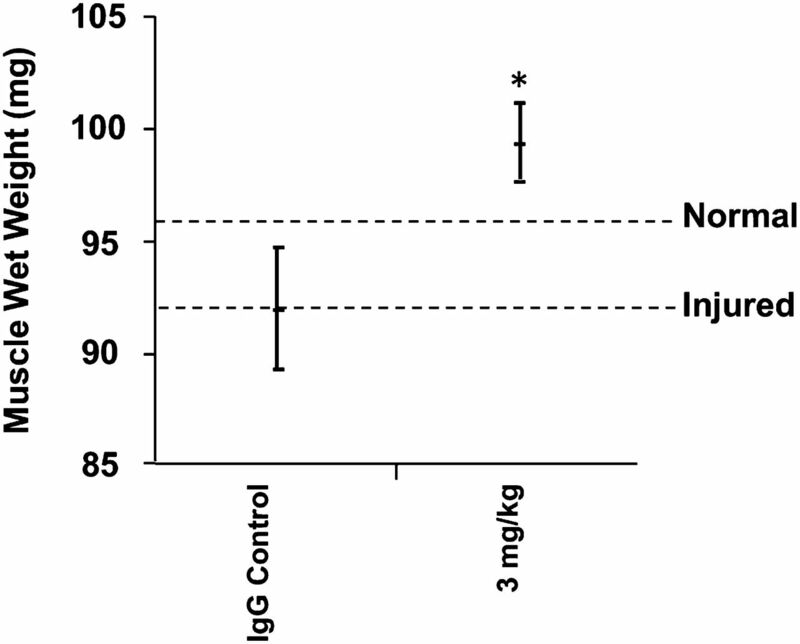 Muscle injury was conducted using a 100 μl injection of 10 μM cardiotoxin (CTX; from naja nigricollis; Calbiochem, La Jolla, CA) solution (diluted in physiologic saline) into the right gastrocnemius muscle with a three-point injection technique. In the CTX-induced injury and immobilization, CTX injections were performed as described above and were subjected to hind limb immobilization with the use of Vet-Lite casting (Jorgensen Laboratories, Loveland, CO). i.v. or s.c. administration of the follistatin variants commenced three hours after the i.m. injection of CTX, and the injured gastrocnemius muscles were subsequently harvested at specified time points to assess muscle mass. In Vitro Binding, PK, and PD Properties of Follistatin in Mice. Follistatin is post-translationally spliced into two distinct isoforms, FST288 and FST315, which differ by the presence of a highly acidic domain in the 315 isoform. In early comparisons of these two isoforms, we found FST288 to exhibit poor protein expression and purification attributes, relative to FST315 (unpublished data). As a result of these initial studies, FST315 was found to be a more suitable platform for engineering, and the studies described here focused solely on this variant. As described in Materials and Methods, we used a C-terminal hexahistidine tag on FST315 for ease of purification. The histidine tagged FST315 binds directly to and inhibits both activin A and GDF8/myostatin from binding to their mutually shared cognate receptor (activin A type II receptor) in a SMAD 2/3 reporter gene cell-based assay (Table 1). The potency of the histidine-tagged FST315 was similar to that of commercially available follistatin (R&D Systems) when compared in our SMAD 2/3 reporter assay (unpublished data), indicating that the tag did not have an influence on the activity of FST315 in vitro. Given these data, we used the histidine-tagged FST315 for all the PK and PD studies described here. After a single i.v. or s.c. administration of 3 mg/kg to mice, FST315 was cleared rapidly from the circulation (Fig. 2A). FST315 was characterized by a mean clearance and half-life of 5269 ml/h/kg and two hours in mice, respectively, after the i.v. dose (Table 2). The s.c. bioavailability (%F) was ∼90% (Table 2). Because the in vitro assessment of FST315 confirmed activity and the mouse PK data showed some exposure, we evaluated the PD effects of FST315 on repairing muscle in a model of muscle injury after both s.c. and i.m. administration to atrophied mice. This particular model was chosen on the basis of the existing data showing that inhibition of myostatin helps expedite muscle repair (Sharma et al., 2001). Evaluation of the PD properties of FST315 in mice showed that the protein did not significantly increase muscle mass (as assessed in the gastrocnemius) or body weight after daily s.c. administration of 1 or 5 mg/kg for seven days (Fig. 3). However, FST315 showed an improvement in muscle mass (∼14%) when administered i.m. at 0.5 mg/kg daily to the atrophied muscle in mice for seven days (Fig. 3). These data suggest that the lack of effect after the s.c. administration to mice was likely to have been attributable to poor exposure and/or distribution to the muscle tissue. The PKs of FST315, FST-Fc and FST-ΔHBS-Fc in C57Bl6 mice. (A) PK profiles of the FST315 following a single 3 mg/kg i.v. (●) or s.c. (□) administration. (B) PK profiles of the FST-Fc (□) and FST-ΔHBS-Fc (●) after a single 3 mg/kg i.v. administration. (C) PK profiles of the FST-Fc (□) and FST-ΔHBS-Fc (●) after a single 3 mg/kg s.c. administration. Plasma concentrations were determined using a validated enzyme-linked immunosorbent assay (ELISA) for each molecule. Data are the mean ± S.D. of three animals/time point for FST315 or mean of two animals/time point for FST-Fc and FST-ΔHBS-Fc in mice. Plasma concentrations determined using validated antigen capture ELISAs and determined from noncompartmental PK analyses. Local delivery of FST315 improves muscle regeneration in the CTX injury model. 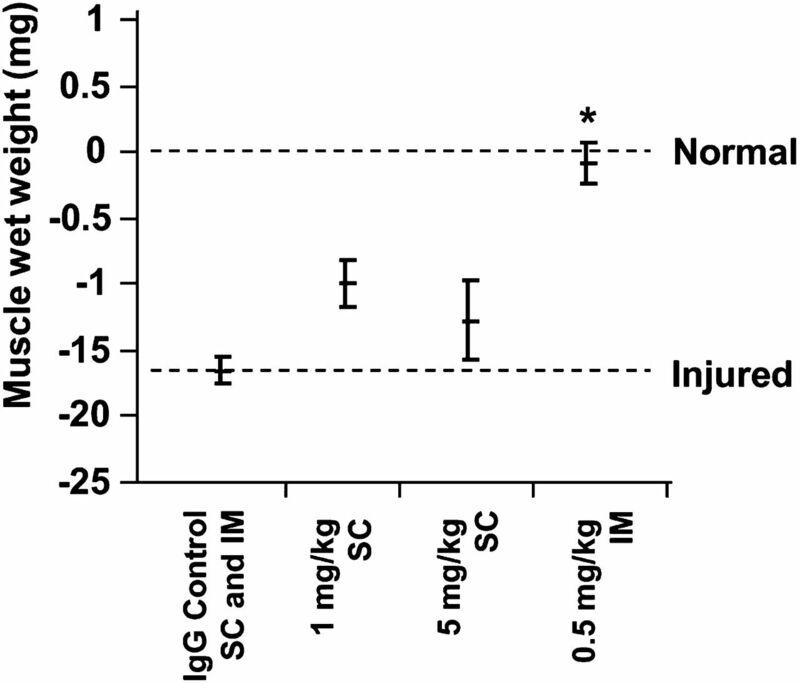 C57BL6 female mice were subjected to skeletal muscle injury by i.m. injection of CTX into the gastrocnemius muscle. Mice received FST315 daily by either subcutaneous (systemic) or i.m. (local) injections, which started three hours after muscle injury was induced. Muscle mass was assessed at seven days after injection/treatment. Data are expressed as means ± S.E.M. of six to eight mice/group. Significance is indicated *P ≤ 0.05, drug-treated group versus IgG-treated group (Dunnett’s one-way analysis of variance). Fusion of FST315 to a Murine IgG1 Fc. Because native FST315 showed a modest effect on muscle in mice after a local i.m. administration, we were prompted to fuse follistatin to a murine IgG1 Fc to determine the in vitro binding and PK/PD properties of this fusion protein. Ligation of FST315 to the Fc created a variant with two follistatin molecules on the N-terminal end of each half of the Fc region, FST-Fc. Table 1A shows the consequence of these combined modifications on the inhibitory activity of FST-Fc toward activin A and GDF8 in our SMAD 2/3 reporter cell-based assay. Relative to unmodified FST315, FST-Fc resulted in a 6.3-fold and 18-fold improvement toward activin A and GDF8, respectively. These results indicate that addition of the Fc and subsequent dimerization of native FST315 lead to significant improvement of ligand-binding activity of follistatin in vitro. The mean PK concentration-time profiles for the FST-Fc are shown in Fig. 2B. FST-Fc was characterized with ∼200-fold and ∼30-fold improved exposure (AUC) and half-life, respectively, in mice, relative to FST315 after i.v. administration (Fig. 2B and Table 2). After a single i.v. administration of 3 mg/kg to mice, FST-Fc was characterized by a mean clearance and half-life of ∼28 mL/h/kg and ∼60 hours, respectively (Table 2). The s.c. bioavailability (%F) of FST-Fc was ∼60%. In this evaluation, we also extended the duration of the dose (14 days, compared with 7 days for the FST315 studies) to provide ample opportunity for the molecules to produce a systemic effect in mass and to overcome the potential limitations of the FST-Fc molecule with regard to its ability to interact with heparan sulfate (discussed further below). Evaluation of the PD properties of FST-Fc in our CTX-induced mouse muscle atrophy model also showed that FST-Fc increased gastrocnemius muscle mass (∼6%) after daily s.c. administration for 14 days (Fig. 4). Subcutaneous administration of FST-Fc promotes muscle regeneration. Mice received FST-Fc daily by s.c. injection, which started three hours after muscle injury was induced. Muscle mass was assessed at 14 days after injection/treatment. Data are expressed as means ± S.E.M. of six mice per group. Significance is indicated *P ≤ 0.05, drug-treated group versus IgG-treated group (Dunnett’s one-way analysis of variance). Effect of the Removal of the Heparan Sulfate-Binding Site on the In Vitro Ligand Binding, PK, and PD Properties of FST-Fc. We chose to remove the heparan sulfate-binding region in our FST-Fc construct with use of the mutation described by Sidis et al. (2005) and assess the influence of this removal on the in vitro ligand binding and PK/PD properties of the molecule. Heparan sulfate binding was assessed using a heparin sepharose chromatographic approach that assessed binding of each follistatin variant as a function of sodium chloride concentration required to remove bound molecules. Unmodified FST315 showed a strong affinity toward heparin, as evidenced by the high concentrations of salt (<500 mM) required for eluting the compound from the heparin affinity column. The Fc did not readily alter these heparin-binding characteristics (Table 1B). However, we did observe a clear decrease FST-ΔHBS-Fc heparin-binding activity, as evidenced by a substantial reduction in the amount of salt (120 mM) required to elute bound protein from the heparin affinity column (Table 1B). These data coupled with those found in Table 1A indicate that reduction in follistatin heparin-binding activity does not negatively impact the in vitro activity of the molecule. The mean PK concentration versus time profiles for FST-Fc and FST-ΔHBS-Fc are shown in Fig. 2B. The FST-ΔHBS-Fc molecule showed ∼4.8-fold slower CL and ∼2-fold longer elimination phase half-life, relative to FST-Fc in mice (Fig. 2B; Table 2). We further evaluated the PD effects of FST-ΔHBS-Fc versus the FST-Fc on tissue repair in a more aggressive form of muscle injury by combining CTX-induced injury and immobilization. Daily s.c. treatment of the FST-Fc molecule showed a significant but small increase in injured muscle mass (6%), and alternate day s.c. administration of the FST-ΔHBS-Fc produced a robust 27% (high dose) increase in regenerating mass (compare Fig. 4 with Fig. 5A). Subsequent to this finding, weekly s.c. administration of FST-ΔHBS-Fc was tested in the same injury model and was found to significantly increase muscle mass in a dose-dependent manner after 14 days (Fig. 5B). The effect of the re-engineered FST-ΔHBS-Fc molecule in muscle repair. Mice were treated with a titrated dose of FST-ΔHBS-Fc starting three hours after muscle injury was induced every other day (A) and once weekly (B). Gastrocnemius muscle mass was measured at 14 days after injury-immobilization/treatment. Data are expressed as means ± S.E.M. of seven mice per group. Significance is indicated *P ≤ 0.05, drug-treated group versus IgG-treated group (Dunnett’s one-way analysis of variance). As a biotherapeutic, follistatin is a promising potential that may be used to modulate biologic processes in a broad spectrum of disease states. Many studies of the biologic activity of this protein have been limited to gene therapy approaches using adeno-associated viral delivery (Takabe et al., 2003; Kota et al., 2009; Medina et al., 2009; Foley et al., 2010). These investigations have shown that follistatin has potent antiinflammatory activities, wound-healing properties, and muscle hypertrophy and hyperplasia-stimulating effects in rodents and nonhuman primates (Kogure et al., 1995; Wankell et al., 2001; Fuwii et al., 2005; Fumagalli et al., 2007; Tsuchida, 2008; Zimber et al., 2011; de Kretser et al., 2012). Despite these encouraging results, the investigations of the therapeutic effects of follistatin have likely been limited because of challenges associated with gene therapy and the complex structural/biochemical properties of the native protein that have limited study after parenteral administration. Thus, the overall goal of our studies was to develop and characterize a follistatin variant that could be administered parenterally and to explore its PK and PK/PD properties in a mouse model of muscle degeneration. There is a paucity of studies on the PK and PD properties of systemically administered follistatin. To date, only a single investigation into these relationships has been performed in the context of a mouse model of liver regeneration after 70% hepatectomy (Kogure et al., 1995; Kogure et al., 1996). In this study, a relatively low dose (1 μg) of recombinant native FST288 was administered via intraportal infusion to rats after a partial (70%) hepatectomy. The authors showed that this relatively low dose of drug was capable of increasing liver regeneration rates and remnant liver weight, relative to control-treated animals (Kogure et al., 1995). However, no effect on liver was observed after a single i.v. infusion of the protein (Kogure et al., 1995). In a follow up study, a PK evaluation of FST288 after i.v. administration showed a pronounced rapid clearance and short (elimination half-life, ∼130 minutes) of 125I-labeled compound. Thus, these studies suggest that the lack of pharmacology after i.v. administration was likely to have been attributable to the limited tissue distribution and/or rapid systemic clearance of follistatin. Consistent with these reports, our data investigating the PK/PD relationship of the more acidic variant FST315 in the context of normal mice and in a mouse model of muscle injury show that repeated s.c. administration is unable to induce a significant increase in the mass in the injured muscle (Fig. 3). Conversely, when FST315 was administered i.m., at a fraction of the highest subcutaneous dose tested, a robust increase in muscle mass that approaches the uninjured muscle mass was observed (Fig. 3). This dependence on delivery route was clarified by PK assessment of FST315 in mice, in which both i.v. and s.c. administration resulted in rapid systemic clearance and short circulating half-life (Fig. 2A; Table 2). Taken together, our data suggest that FST315 is active in increasing muscle mass when it reaches the target tissue; however, its poor PK properties do not allow concentrations of drug to accumulate in muscle after systemic administration that are sufficient to induce the intended pharmacology. Our initial PK/PD findings on systemically administered FST315 are not entirely surprising, given the previous reports (Kogure et al., 1996), as are not the biochemical properties of the protein. Some of our systemically administered FST315 may have been cleared through renal filtration, because the molecular weight of FST315 is ∼38 kDa. Previous studies with 125I-labeled follistatin support this hypothesis (Kogure et al., 1996). In addition to the molecular weight of follistatin enhancing the clearance of the protein, the intrinsic heparan sulfate-binding properties of the molecule (Sidis et al., 2005) may have restricted broad in vivo distribution of the protein. Heparan sulfate binding sites in proteins are known to facilitate rapid systemic clearance mediated by binding to cell surface heparan sulfate present on vascular endothelial cells (Bernfield et al., 1999). Our studies with FST315 indicate strong heparin-binding activity, as evidenced by high ionic strength required for elution from the heparin column (Table 1B). These properties of follistatin may have also facilitated interactions with heparan sulfate on vascular endothelial cells and, thereby, served as another mechanism of clearance of the molecule. Thus, in conjunction with the small molecular weight, the heparan sulfate-binding properties of follistatin also likely contributed to a lack of effect on muscle after s.c. administration to mice in our studies. Taken together with our initial PK/PD data, these properties of FST315 strongly suggest that it would be difficult to achieve a systemic effect (at least for muscle-based diseases) without multiple administrations. Depending on the disease state and therapeutic window of effect, to compensate for the renal clearance/heparan sulfate-binding components, FST315 would likely have required much higher doses and/or more frequent administration to achieve an intended pharmacological effect. It is also important to consider, from a practical perspective, that it is desirable for a chronically self-administered biotherapeutic to be optimized in terms of reduced dose frequency for patient convenience/compliance. With these points in mind, we focused our efforts on engineering a follistatin variant with improved in vivo exposure and tissue distribution properties. Fusion of FST315 to a murine IgG1 Fc created a symmetrical dimer of FST315 and increased molecular mass from ∼38 to ∼120 kDa. PK evaluation of FST-Fc in mice confirmed improvements in both exposure (as determined by AUC comparisons) and terminal half-life, relative to FST315 (Table 2). These improvements were likely to have been linked to increasing the overall molecular weight of the molecule and, thereby, decreasing renal clearance. In addition, the Fc region is likely to provide interactions with the neonatal Fc receptor. Neonatal Fc receptor has been well established to impart salvage both IgG and IgG-derived Fc-containing fusions from intracellular degradation and is responsible for the long circulating half-life of this class of proteins (Datta-Mannan et al., 2007; Goebl et al., 2008; Kuo and Aveson, 2011). Additional studies are required to determine the relative contribution of increasing the molecular mass versus Fc salvage on the mechanism(s) that led to the improved FST-Fc exposure. In addition, cell-based functional assessments of FST-Fc inhibitory capacity were found to be improved with regard to both activin A and GDF8/myostatin inhbitiory activity, likely because of the forced dimerization of follistatin resulting from the Fc fusion (Table 1A). Together, these improvements in the PK and functional properties of follistatin were sufficient to induce changes in muscle mass in a mouse model of muscle injury when FST-Fc was given s.c. on a daily basis, whereas previously local i.m. delivery of FST315 to the injured muscle was required for activity (Fig. 3). These results strongly supported our hypothesis that improved systemic exposure of follistatin can lead to an enhanced PD effect. Of interest, although we observed improvements in the PK/PD properties of FST-Fc relative to native FST315 after systemic administration, comparison of the PK profile of the fusion protein with other published Fc fusion proteins and monoclonal antibodies of comparable molecular weight showed that its clearance was more rapid than anticipated (Vugmeyster et al., 2012). We hypothesized this disconnect was attributable to the heparan sulfate-binding properties of FST-Fc. FST315 contains a heparan sulfate-binding region that has been reported to exhibit high affinity for cell surface heparan sulfate (Inouye et al., 1992). Because of the relatively high abundance of heparan sulfate present on the endothelia, we hypothesized that removal of this activity would lead to further improvements in PK and PD. This seemed to be a reasonable path forward for follistatin, because removal of the heparin sulfate-binding region of other proteins, such as Glial cell line–derived neurotrophic factor, have been shown to improve their PK properties (Piltonen et al., 2009). Therefore, we generated a second variant of FST-Fc (FST-ΔHBS-Fc) that reduced native heparan sulfate binding based on methods originally described in Sidis et al. (2005), to generate a heparan-deficient binding variant called FST-ΔHBS-Fc. Reduction in the heparin-binding activity of FST-ΔHBS-Fc was confirmed using heparin chromatography (Table 1B), and functional cell-based activity did not show any significant impact in FST-ΔHBS-Fc inhibitory potency toward activin A and GDF8/myostatin, relative to FST-Fc (Table 1A). These findings are not consistent with previous speculations that inhibition of activin A by follistatin is modulated by heparin binding to form a more potent and stable inhibitory complex, which may be attributable in part to the improved inhibitory activity of FST-Fc, relative to FST315 (Table 1A). PK assessment of FST-ΔHBS-Fc showed that, as hypothesized, removal of the heparin sulfate-binding activity lead to further improvements in the systemic exposure (∼4.8-fold slower CL) and terminal half-life (∼2-fold greater), relative to FST-Fc (Table 2). Indeed, further improvements were observed in the PD effects of FST-ΔHBS-Fc in the mouse muscle injury model, because s.c. delivery on either a Q2D (Fig. 5A) or a Q7D (Fig. 5B) dosing frequency could induce robust and significant dose-dependant increases in muscle mass. One aspect of FST-ΔHBS-Fc that was not evaluated in this study was the impact of the N-linked glycosylation on the PK/PD relationship of the molecule. Of note, the detailed glycosylation characteristics of molecules can play a critical role in defining the PKs (and by extension, PD) attributes of glycosylated biotherapeutic proteins. Perhaps, the most well-documented example of how N-linked glycan heterogeneity can negatively impact PK behavior of the molecule is with erythropoeitin (Dordal et al., 1985; Tsuda et al., 1990). These studies have identified that the most critical aspect of erythropoetin’s glycan structure is the amount of neuraminic acid (NA or sialic acid) incorporation. Suboptimal sialic acid incorporation leads to recognition and subsequent rapid removal of the compound from circulation via a carbohydrate-based interaction with a specialized subset of lectin-type receptors present on hepatic cells, commonly referred to as the asialoglycoprotein receptors (Fukuda et al., 1989; Weiss and Ashwell, 1989). Because of the large amount of N-linked glycosylation present on recombinantly expressed FST288 (Hyuga et al., 2004) it is possible that the PK and PK/PD properties in our follistatin variants could be further enhanced through careful evaluation of the N-linked glycosylation profile. These observations provide the basis for future studies that examine the further optimization of follistatin-based therapeutics by better understanding the PK/glycan relationship of recombinantly expressed FST-ΔHBS-Fc. In summary, to the best of our knowledge, this is the first report showing the successful engineering of a follistatin variant that has the potential to serve as a platform for developing a parenterally administered biotherapeutic as a broad use in multiple disease settings. Our data suggest that studies of the activity and/or toxicity of this molecule in additional disease models are warranted. The authors thank Selina Estwick for measuring the concentrations of the follistatin and variants; Rong Wang, Laura Myers, and Jennifer Pereira for designing gene constructs and purifying the proteins; Yan Wang, David Halladay, and Xuhao Yang for help with the murine muscle models and the SMAD binding element assay; and Uma Kuchibhotla, Andrew Korytko, and Victor Wroblewski for insightful discussions. Participated in research design: Datta-Mannan, Krishnan, Yaden, Jones, Croy. Conducted experiments: Datta-Mannan, Yaden, Croy. Contributed new reagents or analytic tools: Datta-Mannan, Jones, Croy. Performed data analysis: Datta-Mannan, Yaden, Croy. Wrote or contributed to the writing of the manuscript: Datta-Mannan, Yaden, Jones, Croy. A.D.-M., B.Y., and J.E.C. contributed equally to this work. (2004) Follistatin restricts bone morphogenetic protein (BMP)-2 action on the differentiation of osteoblasts in fetal rat mandibular cells. J Bone Miner Res 19:1302–1307. (2002) Follistatin regulates bone morphogenetic protein-7 (BMP-7) activity to stimulate embryonic muscle growth. Dev Biol 243:115–127. (2004) Follistatin complexes Myostatin and antagonises Myostatin-mediated inhibition of myogenesis. Dev Biol 270:19–30. (1999) Functions of cell surface heparan sulfate proteoglycans. Annu Rev Biochem 68:729–777. (2007) Humanized IgG1 variants with differential binding properties to the neonatal Fc receptor: relationship to pharmacokinetics in mice and primates. Drug Metab Dispos 35:86–94. (2012) The roles of activin A and its binding protein, follistatin, in inflammation and tissue repair. Mol Cell Endocrinol 359:101–106. (1985) The role of carbohydrate in erythropoietin action. Endocrinology 116:2293–2299. (1997) The dorsalizing and neural inducing gene follistatin is an antagonist of BMP-4. Mech Dev 63:39–50. (2010) Evaluation of systemic follistatin as an adjuvant to stimulate muscle repair and improve motor function in Pompe mice. Mol Ther 18:1584–1591. (1989) Survival of recombinant erythropoietin in the circulation: the role of carbohydrates. Blood 73:84–89. (2007) Imbalance between activin A and follistatin drives postburn hypertrophic scar formation in human skin. Exp Dermatol 16:600–610. (2005) Effect of follistatin on rat liver regeneration and tumor growth after portal occlusion. Hepatogastroenterology 52:833–838. (2008) Neonatal Fc receptor mediates internalization of Fc in transfected human endothelial cells. Mol Biol Cell 19:5490–5505. (2004) Analysis of site-specific glycosylation in recombinant human follistatin expressed in Chinese hamster ovary cells. Biologicals 32:70–77. (1998) Direct binding of follistatin to a complex of bone-morphogenetic protein and its receptor inhibits ventral and epidermal cell fates in early Xenopus embryo. Proc Natl Acad Sci USA 95:9337–9342. (1992) Localization of the heparin binding site of follistatin. Mol Cell Endocrinol 90:1–6. (2004) The role of follistatin domains in follistatin biological action. Mol Endocrinol 18:228–240. (1995) A single intraportal administration of follistatin accelerates liver regeneration in partially hepatectomized rats. Gastroenterology 108:1136–1142. (1996) Intravenous administration of follistatin: delivery to the liver and effect on liver regeneration after partial hepatectomy. Hepatology 24:361–366. (2009) Follistatin gene delivery enhances muscle growth and strength in nonhuman primates. Sci Transl Med 1:ra15. (2011) Neonatal Fc receptor and IgG-based therapeutics. MAbs 3:422–430. (2009) Identification of differentially expressed genes during proliferative response of the liver induced by follistatin. Endocr J 56:1067–1077. (2001) Follistatin inhibits the function of the oocyte-derived factor BMP-15. Biochem Biophys Res Commun 289:961–966. (1998) Follistatin: a multifunctional regulatory protein. Front Neuroendocrinol 19:287–322. (2009) Heparin-binding determinants of GDNF reduce its tissue distribution but are beneficial for the protection of nigral dopaminergic neurons. Exp Neurol 219:499–506. (2008) Differential antagonism of activin, myostatin and growth and differentiation factor 11 by wild-type and mutant follistatin. Endocrinology 149:4589–4595. (2001) Myostatin in muscle growth and repair. Exerc Sport Sci Rev 29:155–158. (2005) Heparin and activin-binding determinants in follistatin and FSTL3. Endocrinology 146:130–136. (2006) Biological activity of follistatin isoforms and follistatin-like-3 is dependent on differential cell surface binding and specificity for activin, myostatin, and bone morphogenetic proteins. Endocrinology 147:3586–3597. (2003) Adenovirus-mediated overexpression of follistatin enlarges intact liver of adult rats. Hepatology 38:1107–1115. (2008) Myostatin inhibition by a follistatin-derived peptide ameliorates the pathophysiology of muscular dystrophy model mice. Acta Myol 27:14–18. (1990) The role of carbohydrate in recombinant human erythropoietin. Eur J Biochem 188:405–411. (2012) Pharmacokinetics and toxicology of therapeutic proteins: Advances and challenges. World J Biol Chem 3:73–92. (2001) Impaired wound healing in transgenic mice overexpressing the activin antagonist follistatin in the epidermis. EMBO J 20:5361–5372. (1989) The asialoglycoprotein receptor: properties and modulation by ligand. Prog Clin Biol Res 300:169–184. (2012) Analysis of the interaction between heparin and follistatin and heparin and follistatin-ligand complexes using surface plasmon resonance. Biochemistry 51:6791–6803. (2011) Hair regrowth following a Wnt- and follistatin containing treatment: safety and efficacy in a first-in-man phase 1 clinical trial. J Drugs Dermatol 10:1308–1312.